It was this year's Annual Chaplaincy Lecture at the University of Nottingham. The lecture consisted of a single presentation by a Professor of Theology from Oxford University, titled "Deluded about God? : Richard Dawkins and the meaning of life". The presentation was essentially a response to Richard Dawkins' book 'The God Delusion', published in 2006. Richard Dawkins is a British biologist who has obviously acquired too much knowledge for his own good. In his book he argues that the whole idea of God is nonsense. Hear him: "If this book works as I intend, religious readers who read it will become atheists when they put it down". Needless to say, he is an atheist himself. Dawkins tries to prove by his own intrinsically faulted theories that faith in God is infantile, or childish (I personally don't see how that is a problem, as Jesus himself said that whosoever will enter the Kingdom of God must become like a child). The logic of Dawkins' argument goes something like this: There is no God. But lots of people believe in God. This is a delusion. So how can we account for so many people being deluded? Conclusion: Belief in God is a virus of the mind. There are just a couple of things wrong with this reasoning: One, it is a prime example of what philosophers might call a 'cyclical argument', i.e. it really has no end and no beginning. On what premise did he come to his first conclusive statement that there is no God? Two, even if we were all to accept this warped reasoning pattern, then it would necessarily follow that atheism – which in itself is a form of belief; belief in no God – is also a virus of the mind. The theologian giving the presentation at the lecture was clearly taking a stance against all of Dawkins' claims, trying to explain to a mixed crowd of over five hundred people that the claims have no substance. His task was not one which I envied; in fact, at some point I started to pity him, because of the sheer magnitude of the opposition – spoken and unspoken – in the room. 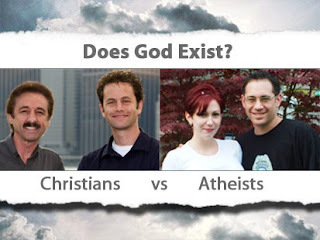 How exactly do you explain God, especially to people who believe that even if He exists, he is not on their side? Being an intellectual discourse, the professor had to try as much as possible to present the facts without coming across as a preacher. I could see he was struggling. The thrust of his argument was this: Dawkins is wrong in stating categorically that there is no God. While it may not be possible to prove without a shadow of doubt that there is a God, it is also impossible to prove 100% (like Dawkins attempts to do) that there is no God. It is interesting to note that not all of Dawkins' colleagues are quite as deluded as he is. Many renowned scientists all over the world accept the limitations of science and recognise the place of God in this cosmos. For all of Dawkins' ignorance, at least he did succeed with something. Without meaning to, he's actually done God a favour. "The God Delusion" since its publication has generated so much controversy and elicited countless responses, including this one. The controversy has stirred up a hunger within people to search for the truth. The truth is that everyone – including Richard Dawkins – has a deep-seated need to find God. God is the missing piece in the puzzle of human lives. To further complicate the human quandary, that piece is at the very centre of the puzzle, so that the puzzle is abstract and meaningless without it. In this part of the world, people have so many questions about God: "What kind of God allows so much pain and suffering?" "If there is a God, why does He allow children to go hungry in Africa?" (Even the hungry children themselves in Africa don't ask God such questions!) "How did everything begin?" "What are we all here for?" "What is the point of living?" The controversy generated in the wake of Dawkins' book has brought these questions again to the fore, and people with answers have a greater opportunity than before to share what they know about God. Hopefully everyone with questions will find the right answer. After about forty five minutes of talking and answering questions from the mostly antagonistic audience, the Oxford professor finally took his seat. A soft-spoken gentleman was then called upon to give the closing remark. Slowly and calmly he read out the words of Acts 17: 22-23: So Paul took his stand in the open space at the Areopagus and laid it out for them. "It is plain to see that you Athenians take your religion seriously. When I arrived here the other day, I was fascinated with all the shrines I came across. And then I found one inscribed, to the god nobody knows. I'm here to introduce you to this God so you can worship intelligently, know who you're dealing with." Considering that this was supposed to be a strictly academic meeting, he could not have made his point in a more subtle way. Of course, by now, you know my stance. In the course of his argument, the professor expounded a lot of theories to arrive at his conclusion, but of all that he said, one statement remains indelible in my mind: "I believe in Christianity as I believe that the sun has risen – not only because I see it, but because by it, I see everything else".